Last week was the end of classes. I had my last class on Wednesday at noon and then I had a history exam at 6pm. I finished it within an hour but think I did fine. That night I stayed in at the apartment hanging out with the roommates. Thursday I slept in til almost two in the afternoon…sad thing is, I was the first one at the apartment to get up. It was our farewell dinner at Blackrock that night. It was really nice, but made me sad to think that we are almost done with being here. Afterwards, we all came back to Merrion Square and then went out. 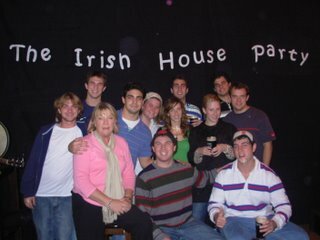 We couldn’t get in anywhere as a big group, so I went to Porterhouse in Temple bar with two Notre Dame kids that I met that night. Friday I slept in again, but this time only til noon. Then I went to Seamus and Marion’s for the weekend to hang out with Laura, Louise and Alison. On Sunday, they brought me to Margaret’s, which is where I am right now. So this week is our week off. And I have tonsillitis. Yes – tonsillitis. Way to go me! At least I am with my cousins so I can sleep all day and relax and not deal with everything else. I’ve just been chillin here and studying. Yesterday I went out to the west coast to see my family out there for one last time before I go home. Speaking of which, I changed my flight…I’ll be home on Dec. 21st. So now, I’ll be back in the ridge prior to Christmas. And then I have my shoulder surgery on the 28th…. Anyways – I miss you all! I spent last weekend with my cousins in Naas. They took me horse racing on Saturday and I babysat my cousins one night. Then I came back on Sunday and chilled in the apartment. Monday night we spent most of the afternoon and evening pregamming and then some of us went out with Scott’s friends from home. We went to Redz with E2 drinks all night which was amazing. Let’s just say that night ended interestingly. Tuesday I spent doing work. I finished my huge entrepreneurial management paper. Then on Wednesday I finished my last paper of the semester. Then a bunch of us left history early to hit up the bar on campus. When I came back, everyone was in the house drinking and we stayed in drinking til 7am. And then there was yesterday; Thanksgiving. But they obviously don’t celebrate here in Ireland. So we decided that we would make our own dinner at the apartmant for everyone. Here’s the catch, there is no turkeys in the supermarket until closer to Christmas so we couldn’t eat turkey. So we decided to go all out for Thanksgiving, but make chicken instead of turkey. So we cooked 6 chickens, 34 pounds of mashed potatoes, 5 boxes of stove top stuffings, canberry sauce, turkey gravy and 8 loaves of garlic bread for 19 people. And for dessert, we bought 3 lbs of ice cream, 4 apple pies, mini elcairs and cheesecake. We spent the entire day drinking wine and ended up going out to a pub called Buskers. Buskers had red, white and blue decorations and had the Thanksgiving football games on tv and it was great. I flew over early on Tuesday morning to Edinburgh and flew back early Thursday morning, so I had two full days in Scotland. On Tuesday I met up with two girls from high school and walked around Edinburgh. It is a beautiful city and the views all around the city are breath taking. I went to an exhibit about the Scotish Tattoo which is a big military show with militaries from all over the world being represented and playing music. I also saw how the woolen mills make the different family patterns and went on a Scotch Whiskey Tour. We ate dinner at a Chinese Buffet, which I know sounds stupid, but it was the cafe where J.K. Rowling started to write Harry Potter. 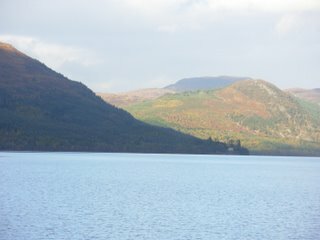 On Wednesday, my friend Emily and I went on a day bus tour of the Highlands. We stopped in Glencoe and some other nice piture taking places on the way up to Loch Ness. On the way, we passed by the Harry Potter Bridge. When we got to Loch Ness, we went on a boat in the Loch and learned about the Loch and what’s inside it; unfortunately, I didn’t see the monster. After Loch Ness, we made two more stops on our way back to Edinburgh. 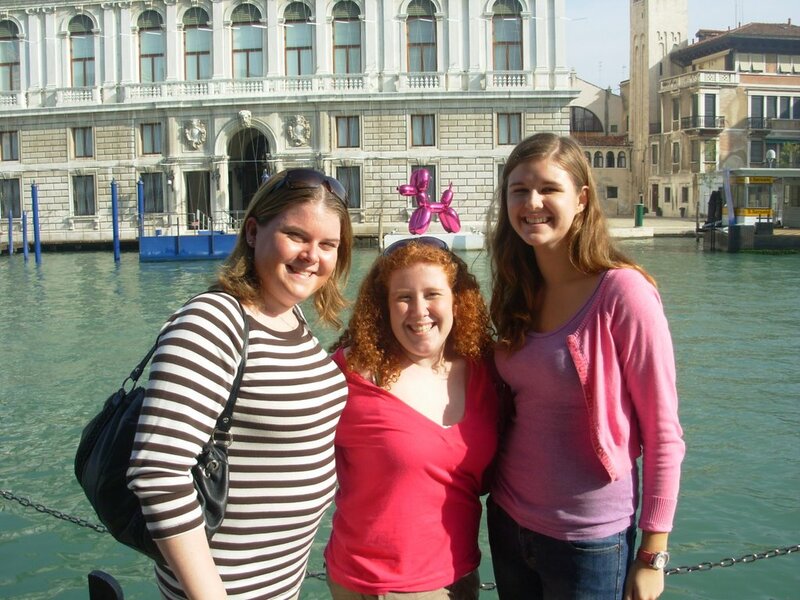 So I went to Venice this weekend with Johanna & Moira. We left bright and early on Friday morning and returned this afternoon. The trip started off interestingly to say the least. On Thursday night I had called and booked a cab to come pick us up at 3:30am on Friday. A little before we were due to leave, I went down and waited in Jo & Moira’s room as they finished packing. Then the taxi driver calls us saying he is outside, so I go out and as I open the door, he is yelling up to some of my roommates that he is going to call the cops. So we all try and talk him out of it as the three of us really need to get to the airport and we don’t need to deal with the cops. But he still calls the cops claiming that a penny was thrown out the window scratching his windshield and he wants someone from upstairs to pay for a new window. Even thought the cops seemed to be taking his side, nothing happened to the boys and we ended up getting to the airport about the same time we wanted to get there by. Then it took forever to check-in and get through security. By the time we got the the waiting area, we only had 5 minutes before we got in line to board the plane. So we walk out to the plane, yes, we walked – there was no gate that you walked right onto the plane throguh, and we all got sets next to eachother. I sleep most of the flight and wake up just in time to hear the pilot explain to us that Venice is completely fogged in and after a failed attempt to land, that we were going to have to go back out to Milan to land. 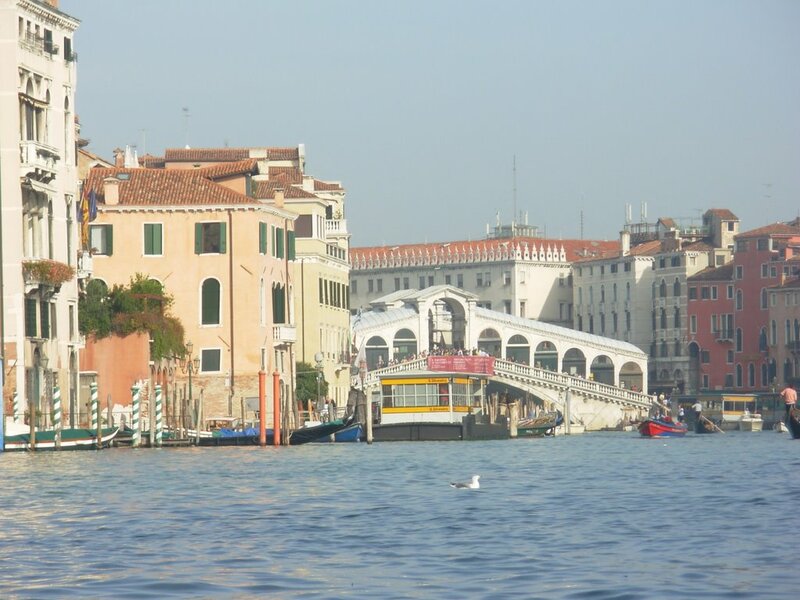 I think, Venice – Milan, both in northern Italy, so not a big deal, right? WRONG!! very wrong. After we got to Milan and went through immigration there, we board a coach bus for just over 3 hours to Venice…that’s longer than we were in the air from Dublin to Venice, find we can’t land and fly to Milan. So the first half our day was wasted there. Once we finally arrive at the correct airport, we were greeted by a shuttle driver that was taking us to our hostel. We went, checked in, dropped off all our stuff and then caught a bus into the city. We had some dinner, had our first authenitce Italian gilatto and walked around not having any idea where we were for about four hours til we caught the shuttle back to the hostel. 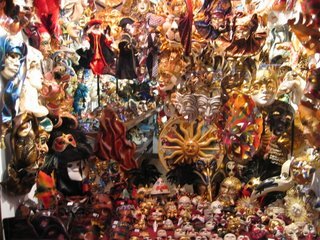 We spent the evening wandering through different alleys of the city in awe of all the beautiful masks, glass work and architecture. As for my first meal in Italy, I was not impressed as my dinner was not what I expected, plus I did not feel the pasta or sauce was exceptional as I would have thought it would be, although the gilatto I had that night was absolutely amazing! 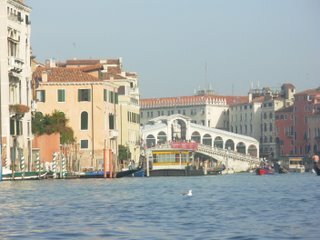 We woke up extra early on Sunday to get into the city early and get to Murano island. We got out there a little after 10 and went to the glass factory. We were able to see a vase and horse be made. 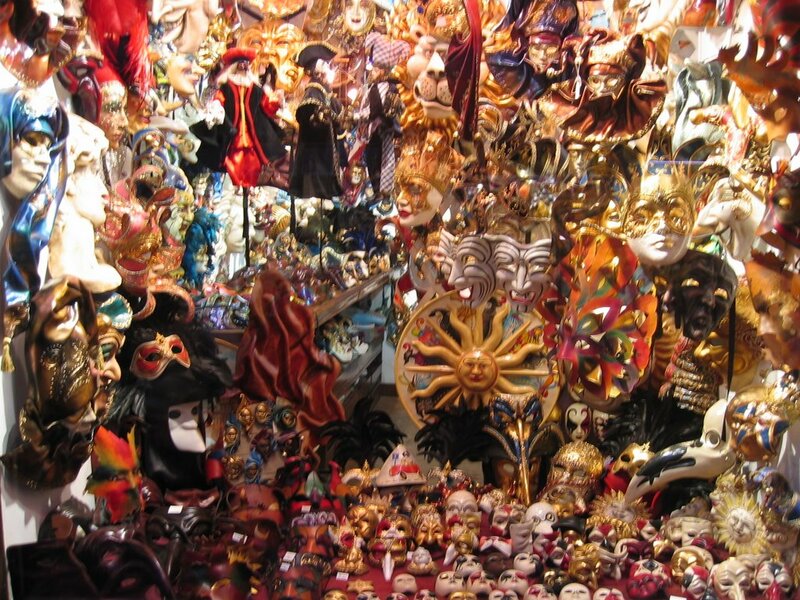 Then we did some shopping in the factory, but the best was on our way back to the water taxi to Venice, we passed a little shop on the side where everything was on sale as the store was under renovation and they just wanted to get rid of all of their inventory. So then we headed back to San Marco for some lunch and I had some amazing pizza, but I still prefer NY pizza. Then we want to St. Marc’s Square and fed the pigeons. 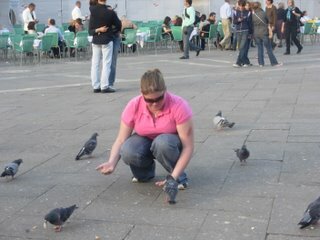 Or at least, I attempted to feed the pigeons but since I am afraid of pigeons, it didn’t last long for me. Then we went into the Basillica. The Basillica is beautiful beyond words and the view of the square you have from there is unbelieveable. After exploring the Basillica, we went back into the square and I tried to feed the pigeons again, but by that time they were too full and I was only able to get one to eat out of my hand but none to land on it. We headed back towards the shuttle early as we had a long day and had done so much walking all weekend. 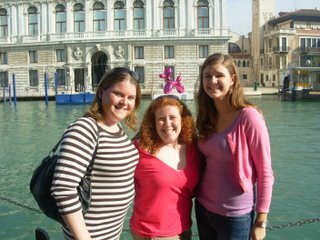 We found a nice snack bar near the shuttle stop and right on the Grand Canal and I had my best meal in Italy by far. This morning we headed back to Dublin and arrived around noon. The flight back was fine, but getting to our apartment was much harder than anyone could have imagined as the Dublin Marathon was on today and the finish line was in Merrion Square, so we had a very long detour just to get back from the other corner of our block. But now I am off to rest up as I leave bright and early tomorrow for Edinburgh til Thursday. On Thursday night, the school had another field trip. This one was here in Dublin at a pub called Toners. But before the night out, a bunch of us from Merrion Square (everyone not in Amesterdam) and some of the kids from Stephens Lane chilled at the apartment and started the night a bit early. To the left is a picture of all the residents of Merrion Square and Stephens Lane, plus Dorothy, that were in attendance Thursday night. Then we went to Toners for an Irish House Party. At the house party, we learned some Irish dances, a song in Gaelic and learned about the history of Irish music. After the party, I went out with Andrew, Mary and Andrea, three other kids in my program here. We met up with Mark and Matt who are also in our program. I ended up staying out really late with Andrea, Matt and Mark, but we all had a great nite. So this weekend, I went to Naas to visit my cousins again. Naas is a town about 30 min. south of Dublin in Co. Kildare. I woke up pretty early to catch a train to Naas and I made it there before lunch. Margaret collected me at the train station in Sallins and took me back to her house. 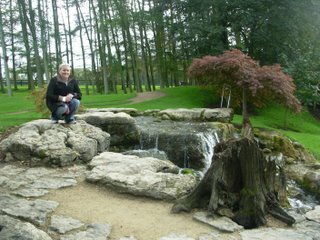 Then she took my to the Irish National Stud and Japanese Gardens in Kildare. We had a nice walk around and saw a bunch of gorgeous old race horses; however, I kept my distance as I didn’t want to have another bad allergy attack. 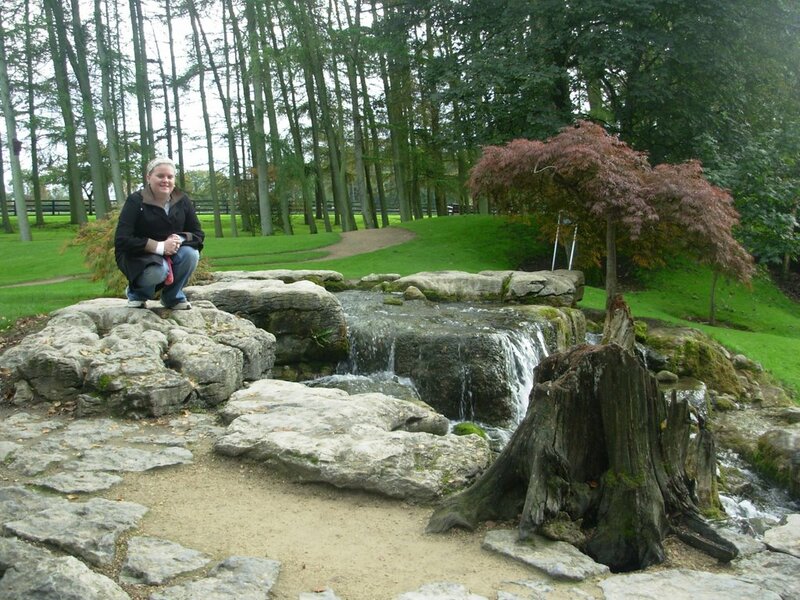 The picture to the right is of me in one of the gardens. Friday night Margaret and Peter made a lovely turkey dinner – it almost felt like Thanksgiving. 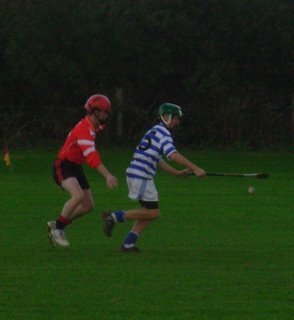 On Saturday morning, I went to see Conor play in the Under-16 Hurling match, he scored a couple of points. His team won the shield; this was a match for the two teams that lost in the semi-finals, so in essence they came in third. Then we stopped by the house for a quick bite and went off to see Eoin in his football match, unfortunatley they lost. 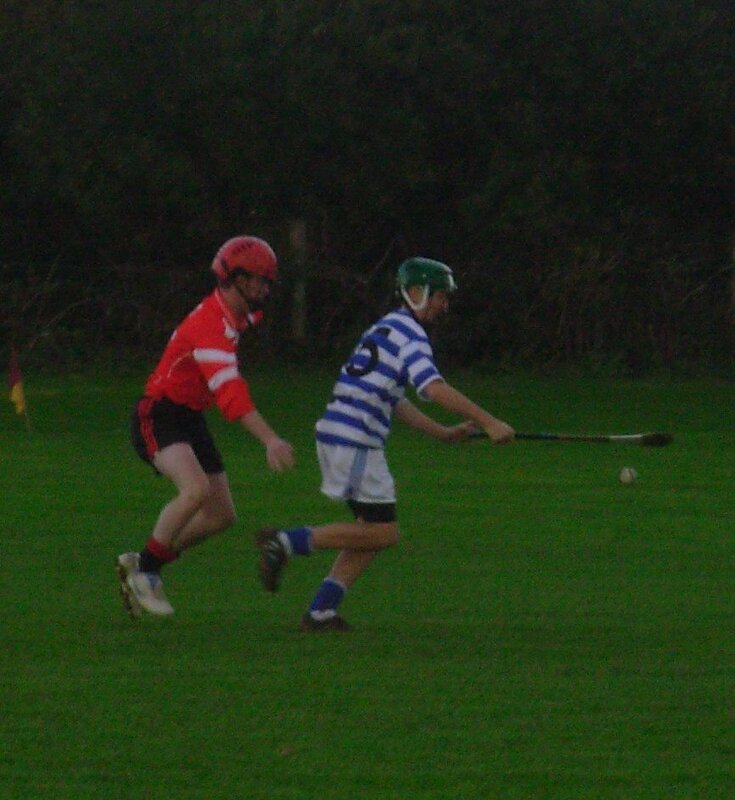 And this afternoon Conor had another hurling match. This one was the final for the Under-14 for the League. They won this game as well with a score of 4-19 to 0-7: thats a total of 31 points to 7 and Conor scored 3 goals and 6 points (a total of 15 points). The pictures below are of my cousins. The one on the left is from Eoin’s football match; he is the one in front in the blue and white shirt. 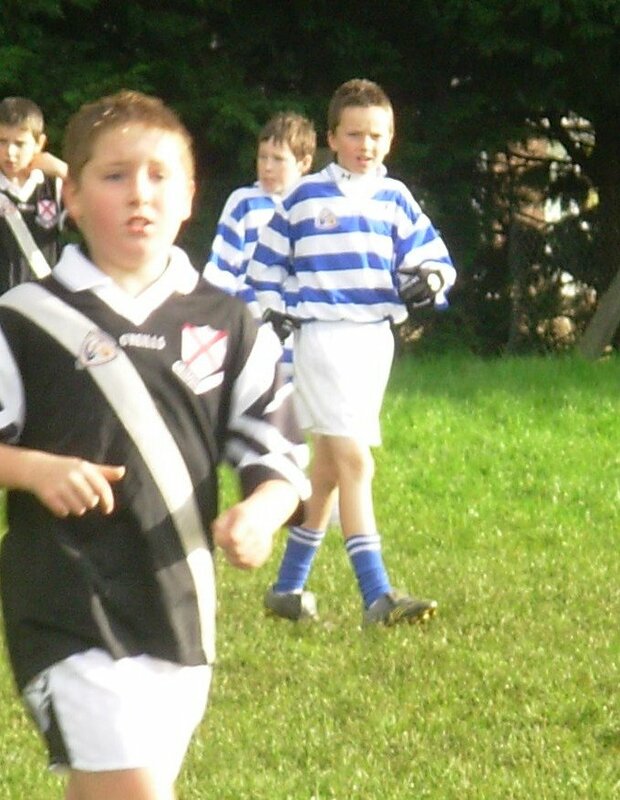 And to the right is of Conor in his match today; he is also in blue and white. Last week whilst sitting in history class I decided that I was going to go away for the weekend. On Friday I went to two small towns north of Dublin. First I went to Malahide to see the Malahide Castle. Then I went to the small fishing town of Howth which I really enjoyed. It was nice to get to walk around and just relax. Then on Friday night I went out with my cousin’s Laura and Louise to a club for Louise’s 17th birthday. Even though I didn’t know Louise til that night and the only people I did know were Laura and Abu (Laura’s boyfriend), I had an absolutely amazing time. 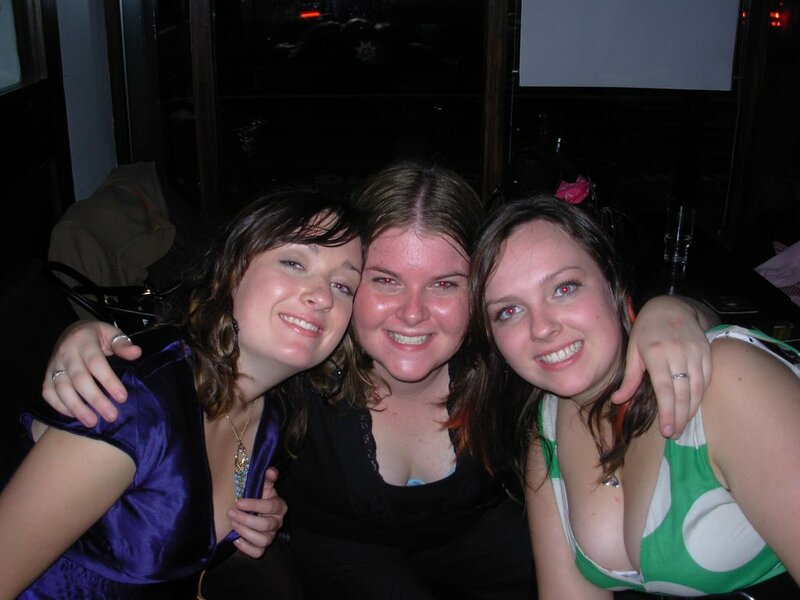 In the picture, it is Laura, Me and Louise. So then I woke up early on Saturday morning to catch a very early train to Cork. I took a train directly from Dublin to Cork. One in Cork, I went to Bru Bar & Hostel to check in. It was a very nice and very clean hostel…it is rated top 10 hostels in the world. After checking in, I dropped off my bag and then walked back to the train station. From Cork, I boarded another train and went to Great Island to the town of Cobh (pronounced Cove). Cobh used to be called Queenstown and you would probably know it as the last port that Titanic stopped aat before hitting the Atlantic. To the left is a picture of Anne Moore and her two little brothers. Anne was the first immigrant to be processed at Ellis Island in New York. 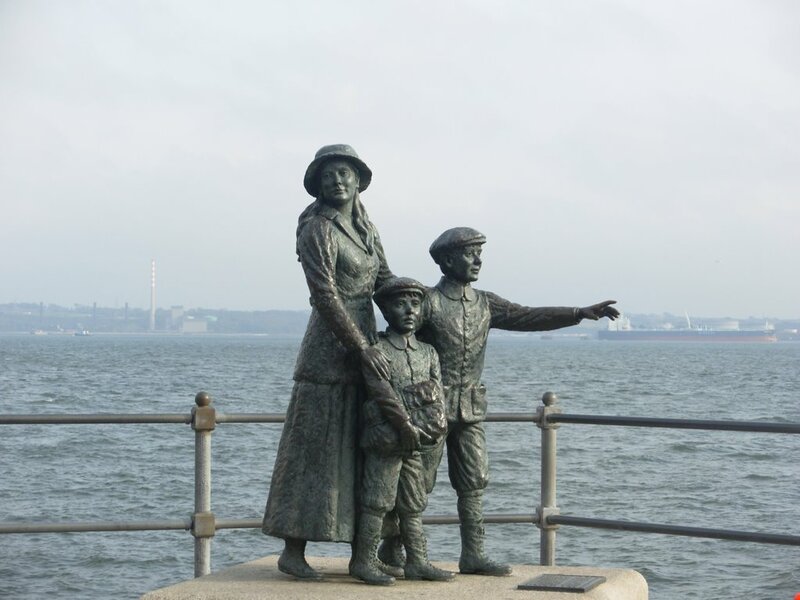 While in Cobh, I went the the Queenstown Story to learn about Irish immigrants to the US as that is the port where most left from, including my great-grandmother. I also went to the Cobh museum and St. Coleman’s Cathedral. After that I just walked around for a while and saw a bunch of monuments that are up in the town. On Saturday evening, I was back in Cork. I went to my first mass in Ireland at St. Patrick’s in Cork City. Then after grabbing a sandwich for dinner, I headed back to the hostel and two of the girls in my room asked me if I would like to join them in going to the Cork Film Festival that night. I accepted the invitation and we went to see a movie called “The Namesake”. It was very good and I am glad I went as I enjoyed it but it is not a movie I probably would have dropped $10 on at home. Sunday morning I also was up early as I wanted to catch the first bus to Blarney. I got to Blarney only a short while after the castle opened and it was a very overcast day which turned out to be perfect as there were not a lot of people there. I made my way to the top of the castle, and yes, I did kiss the Blarney Stone. After I kissed the stone, I walked around the grounds for a while and saw the rock close. I then went to the Blarney Wollen Mills for lunch and to look around the shop. I then went back to Cork where I walked around for a little and then came back to Dublin. Tonight I have my first water polo trainning. Then tomorrow night we have an Irish House Party at a pub near the apartment and I am going to Naas again for the weekend to see Margaret and the boys. During the week I hung out around the apartment a bit and chilled with my roommates from Fordham and UMASS Dartmouth since my other roommates were all at Oktoberfest. It was pretty uneventful except one night we all cooked a family dinner, watched a movie and went to O’Donoghues for a pint. We had a good time talking and really getting to know more about each other. Training for swimming started on Thursday night. Practice is only an hour long and you just swim whatever you want to. Even though it seems a bit disorganized, I like it since my shoulder doesn’t allow me to swim as much as others and I haven’t swum competitively since I was on Barracudas. After training, we all went to a pub for a couple of drinks. I ended up staying out really late with the boys’ captain, his girlfriend and one of the other girls from the team. 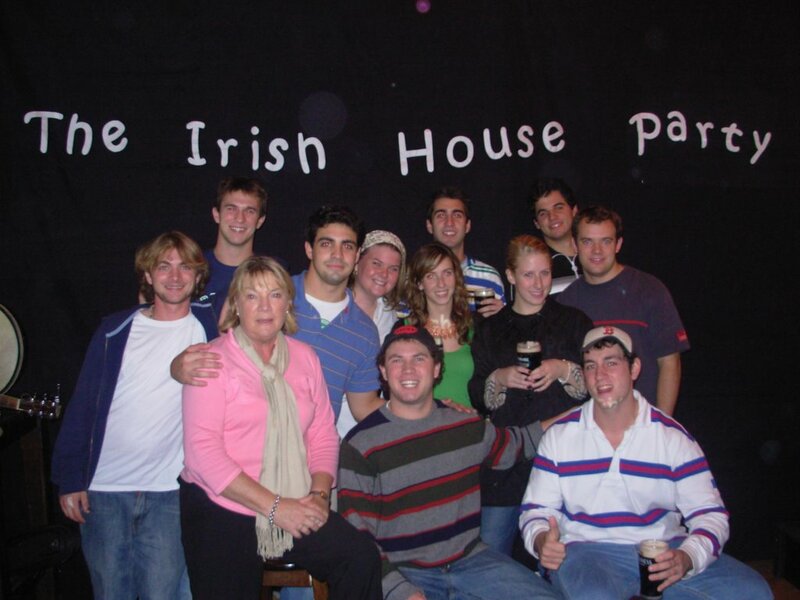 It was a fun time and I liked hanging out with Irish kids. Plus, the girl I know from South Salem that is here studying abroad in the Arts program also is swimming for UCD this semester. This weekend I had two field trips for school. On Friday we went for a walk of the Wicklow Mountains. It was pouring rain and everyone was pretty miserable hiking up the mountain. But it stopped raining by the time we got to the top and it was well worth walking in the rain since the view from the ride was absolutely beautiful. On the way back we stopped at a tavern in Glendalough for a really good dinner. And we were all sitting near the fire which was extra nice since it warmed us all up. Then yesterday morning, we went to Kilmainham Gael which is the jail that all the political prisoners were killed in during the 1916 Uprising. After the field trip, I walked with Mary and Andrew back to the City Center this was a very long walk as we were in the outskirts of the city and the is on the other side of Dublin. We grabbed a bite to eat and then hit up the National Museum of Artifacts and History. Even though I was there last weekend, I am glad that I went back again because I was able to see upstairs which was closed last weekend and I took another look at the Bog Bodies exhibit. We also went to the National Gallery, which I also hit up last weekend. But we saw a bunch of paintings I didn’t see last time as I wasn’t there for very long last weekend. The boys have four girls from Bentley visiting now, so we went out the past two nights to Zanzibar. It is a pretty cool club; although it was pretty empty on Friday night. That’s really all for now. I’ve been feeling pretty crappy the past day or two, but I think it’s just from being in overdrive lately and I just need a break. The only things I have coming up this week are getting to meet two more of my cousins on Tuesday night and then going on a mystery tour Thursday night which is when we go to three clubs somewhere in Ireland and are out from noon to 3am. But that’s it. I’ll keep you updated…. After Irish History class, we came back to the apartment, ate dinner and then went out. We went to Tramco in Rathmines. It was the Erasmus student party and all the kids from Wake Forest were there so we had a fun time till like 3am when I came home. This night we stayed in. Scott’s parents landed in Dublin and came over to say hi to everyone and see the apartment. Scott’s parents took all the boys and myself out for dinner at a nice Italian place (seeing a trend here?) Then we took them to Oliver St. John’s in Temple Bar. We met up with the girls there and had a great time. Today was a field trip to Kilkenny. We left school around 11:30 and got to Kilkenny a bit before 2. Once we got there, we got soup and bread for lunch. Then we all went on a tour of the Kilkenny castle. It was amazing and I had a lot of fun. After that, we went on a walking tour of the city and ended up at the old witch’s house which is now a tavern and that’s where we all ate dinner. Today I went to the National Gallery and saw a few paintings that I loved; one of which was the dinner at Emmaus. Then I went to the National Museum of Natural History which pretty much sucked as it is only dead, stuffed animals. So then I walked over to the National Museum of Artifacts and History. Even though most of it was closed, I was glad I went because I got to see the Bog Bodies exhibit, which is where artifacts and bodies that have been found in the bogs by harvesters are on display. It was very interesting. Then I bought a gold claddaugh ring for myself. I spent a lot of the day on campus today as we have no internet in the apartment. Tonight, I am enjoying a quiet night in since Dave and Kevin are at Amy and BJ’s apartment and the rest of the boys are at Oktoberfest. the last week and a half…. Last Monday night was amazing. Jo and Moira came with me to see my cousin Tom Allen play his banjo at a pub called Hughes. It was such a great night cause it was a real irish pub with a great atmosphere. It was awesome to have a nice night out experiencing true Irish culture. Tuesday night we all went out to celebrate Tom’s 21st birthday, which was Wednesday. We went out to this nice Italian restaurant in Temple Bar. Then we went to Porterhouse and since they close at 11:30pm, they gave us cards to get into the VIP bar upstairs for free. So we go upstairs and after I buy a round of shots at midnight and spend too much, we realize that Michael Jordan is in the club too. So all the girls and Tom ended up getting to meet him. Then on Thursday night I went to Naas to visit my cousins. I had quite a wonderful weekend with Margaret, Peter and the boys. We watched most of the Ryder Cup and had a good time. When I got their on Thursday, Margaret and Eoin met me at the train station and when we got back to their house, Eoin asked me to help him decorate the front window for the Ryder Cup. On Friday night, Margaret and Peter took me out for dinner at a nice restaurant in Naas to celebrate Conor and my birthdays. On Saturday, we took a break from watching the Ryder Cup and Margaret took Eoin and me to the gym to go swimming. And then on Sunday, Seamus, Marion and their daughter, Alison, came to Margaret’s for the afternoon. We had a lovely dinner and played some baseball in the backyard. Then Seamus, Marion and Alison drove me back to my apartment as they live closer to the city center than Margaret. On Monday night we all went out for my birthday. We went to another Italian place and had a good time. But yea. Thats all that’s new here. I’ll update soon enough….